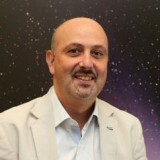 Home › › Pepe Francesco, Prof. Dr.
My job is to make instrumentation for astronomy that allows us to open a new parameter in space and explore the limits of our understanding. Observing and characterising the atmospheres of extra-solar planets is very difficult. In this domain new instruments and methods are urgently needed. On the other hand, it is through the characterisation of their atmospheres that we will learn a lot about other worlds. That’s what we are working for. Physics always fascinated me, since it is able to explain the world surrounding us. There is no bigger satisfaction than understanding phenomena that may have appeared mysterious to you at first glance. We are active in a fast-moving and very competitive domain of astrophysics. The NCCR provides to us the ressources to explore new paths and ideas and, in particular, to put all the Swiss forces together to reach important results. Only by putting the all our competencies together we can succeed in our ambitious goals.